Yellow Jackets! Great right? Fabulous information to know one would think. oh, you ask how i know this? That is a good question; let me explain. Yesterday R and I went hiking at Fall Creek Falls. It is a beautiful state park in Tennessee. We walked down to the Cascade Falls with Chloe, which was a nice walk. She had a great time splashing in the water on the slippery rocks. We'd packed a lunch (hummus, pita bread, broccoli, Doritoes, bananas) and decided to next take a 3 mile loop hike and picnic at some point. the first mile was fine so we stopped, ate and rested for a bit. Once we'd gone another quarter mile the ordeal began. R was about 10 feet in front of me with the dog. He suddenly STOPPED and said "hey there's a beehive." So i start looking around in the trees but he's pointing down at the trail itself. There was a dug out spot on the side of the trail where i can see bugs moving inside even from the distance. He kept standing there and Chloe stuck her nose in it. Then he says "oh we better go." He walked hurriedly about another 20 feet while i stood there trying to figure out how to go around. I decided to run along the other side of the trail and figured i'd be fine. As soon as i got just barely past the nest i felt the first sting. Richard hears me shouting and starts saying "come on come on", so i keep running but also keep getting stung. The bugs followed me. I keep running, passing him, and then he yells something like "Stop! are they in your shirt?" I drop my backpack, pull off my shirt and start running and swatting the air with it, then get stung again under my shorts. I look down and see 5 or so more on my boots. i stomp my own feet, strip off my shorts, and since i'm standing still get stung AGAIN! So now i am running along the trail, wearing just my boots and my underwear, R behind me picking up my stuff as i've dropped it. We run another hundred yards or so when i stop again because i am out of breath and i've realized i am running practically naked through the woods and Richard mentions something about needing to pull out stingers and needing to know if i am allergic. One of my brothers is allergic to bees but as far as I know i am not. He catches up with me, says he hasn't been stung, and he sets all the stuff on the ground: my shorts, his pack and mine. he starts to kind of look me over and i put my shirt back on. R looks at the dog and right as he realizes Chloe has several yellow jackets, NOT bees, on her coat he finally gets stung. He starts swatting with his hat, starts yelling about how we need to run because they are following us and will continue to do so then i get another sting. It went on like this for another mile: we run for a bit, we stop for some reason (like i try to put my shorts back on) and one of us gets stung. by the time we stop being stung we both have the wrong packs on, i am wearing his hat and both my shoes are untied. Richard is both trying to reassure me that i'll be ok with all the stings because it wasn't bees and also asking me about how i'm feeling and warning me about letting him know if i start feeling weird. Luckily, i was dressed by the time we met some other hikers. 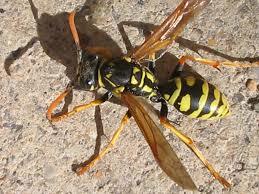 All told, R got stung twice, he knocked about 6 yellow jackets off Chloe, and I got stung at least 12 times. yes, 12 times. One on my back, 3 on my stomach, 1 on my right wrist, 2 on my right thigh, 1 on the back of my right knee, 1 on my left calf, and at least twice on my left ankle. it may be more there as the whole ankle is itchy today. I give this hike a 1! We did hike down to the big falls after this drama but i was distracted from the beauty by the stings. We had planned to do another longer hike but we didn't; we were both jumping at any kind of "buggish noise" we heard and i stung all over. Other than the stingy feeling yesterday and the itchiness today though i am fine. No bad swelling, no shakes or nausea or breathing issues. I did find out that if you get more than 10 any sort of sting you're supposed to go to the doctor. So apparently I am not allergic to yellow jackets. Some day this will all be very funny! But considering that my own memories of being stung by bees, under my shirt, from last summer is still a painful set of memories I sympathize with you and am so very sorry!!! I hope everything clears up quickly! thanks! at this point the stings are more like really bad mosquito bites. lots of benadryl. I also got a different itch stopper with benzocaine which is heaven!